URL shorteners are a useful tool when sending emails. Not only are long links unsightly, they often break inside email clients becoming useless. I use Gmail for my email client and was delighted to see that bit.ly introduced an application that provides a URL shortener right inside Gmail. Scroll down to the very bottom and click the radio button to enable "Add any gadget by URL"
You should now have a gadgets tab at the top of the settings page. Click it. 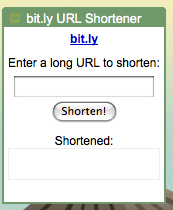 Congratulations you now have a URL shortener application right inside Gmail!